Necrotizing enterocolitis (NEC) is an intestinal disease that primarily affects premature and medically fragile infants. NEC causes an inflammatory process that can lead to intestinal tissue damage and death. Despite significant advances in neonatal care, the morbidity and mortality rates associated with this disease have not significantly improved in decades. In the U.S. alone, thousands of babies develop NEC each year and hundreds of babies die from this complex intestinal condition. Once diagnosed, many babies only live for a few hours or days, and survivors can have lifelong neurological and nutritional complications. According to the C.D.C., NEC is a leading cause of overall infant mortality in the United States. Research is still needed to fully understand why NEC occurs, when NEC occurs, how NEC occurs, and which neonates will develop the disease. Classic NEC: this is the most common presentation of NEC. A premature infant (most commonly born less than 28 weeks) is 3-6 weeks old and stable, and then within hours develops signs of NEC: a hard distended abdomen that feels like a bowling ball, bloody stools, decreased activity, apnea, bradycardia, low platelet count, and an X-ray with a very characteristic appearance. Sometimes the baby has some mild symptoms like lethargy and poor feeding for a day or two beforehand, but usually there is little or no warning. Some studies have shown that days before the onset of classic NEC, the intestine becomes colonized with large numbers of a certain kind of bacteria that is known to cause inflammation. Transfusion-associated NEC: about 1/3 of all NEC cases occur in a premature infant within 2 or 3 days after a blood transfusion. It appears that the combination of severe anemia and a transfusion is particularly risky. NEC outbreaks: there are reports in the scientific literature of clusters of cases of NEC in which several premature babies in the same NICU get NEC in a short time period, sometimes with evidence of the same bacteria or virus in each baby. Some of these outbreaks have been related to contaminated infant formula or germs that are commonly found in hospitals. These outbreaks are uncommon. Atypical NEC: sometimes NEC presents in an unusual fashion. For instance, it is not typical for NEC to occur in the first week of life or before a baby has been fed. Term infant NEC: the risk of NEC in a baby born at term (37-41 weeks) is about 1 in 10,000. 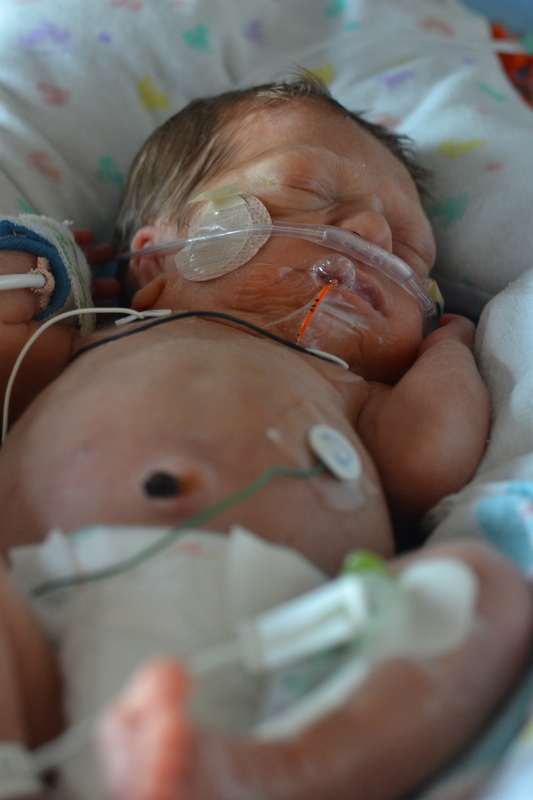 Most term babies with NEC have one of the following: a birth defect involving the heart, a birth defect of the intestines called gastroschisis, or an episode of low oxygen that may occur before or during a difficult birth. The best explanation is some kind of injury to the inside lining of the intestine that then allows bacteria to travel from inside the intestine into the bloodstream. In classic NEC the injury may be inflammation caused by particularly aggressive bacteria. In transfusion-associated NEC, severe anemia may cause an injury that is worsened by the transfusion. In NEC outbreaks a specific bacteria or virus triggers the intestinal injury, and in term NEC, low oxygen levels may cause the injury. The following appear to decrease the risk of NEC, yet none are a guarantee that a baby won’t get NEC. Mother’s own milk is generally better at preventing NEC than donor human milk, but both mother’s milk and donor milk are better protection than formula. Some studies have shown that the combination of human milk and probiotics is more effective prevention than formula and probiotics. Is there any treatment for NEC? Standard treatment for NEC is to stop all feedings, place a large tube through the mouth into the stomach to keep the stomach empty, start antibiotics, and check x-rays of the abdomen at regular intervals. If the baby has signs that the intestine is severely injured, surgery is necessary to remove the dead portion of the intestine. In severe cases, the entire intestine may be dead and when that happens the chance of the baby surviving is very low.